[tapping microphone] HellOOOooo! Is this thing on? Huh. Well, apparently, everybody who reads this blog is either recovering from eggnog hangovers or camping in a secluded cabin in the wilderness with no internet service or toilet paper. So. It's just you... and me. Well, hello there. Come here often? Me, too! Ah, I loved Mary Poppins when I was a kid. Sadly, I haven't seen it in like 20 years so I'm just gonna assume that this cake makes total sense. Kung Fu Panda! Hand-painted landscapes! Nifty little scrolly things! In case you weren't one of the eight people who saw A Bee Movie, this guy is from A Bee Movie. Which was aptly named. Unless maybe they'd gone with C or D movie, of course. [zing!] 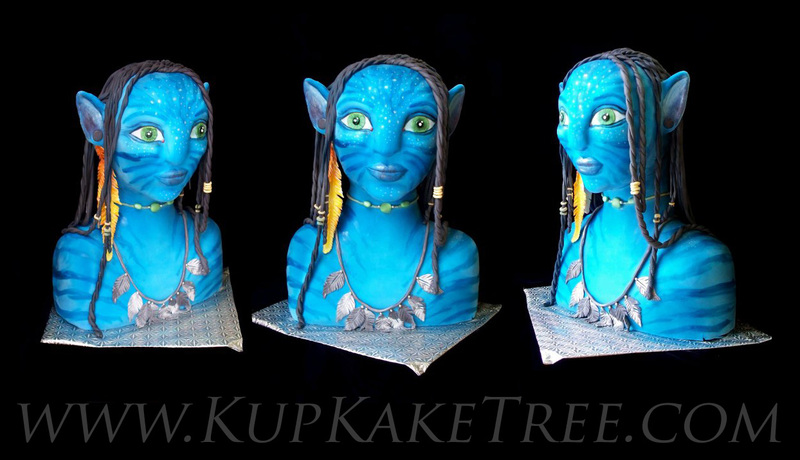 This cake, however, is A+ all the way. Wow. This Mad Hatter's hat from the latest Alice in Wonderland movie is the sum of awe. Or awesome. Or both. I'm digging the tiny tea sets and the "fabric" texture. Oooh, so pretty! So life-like! It's almost like you could just reach out and touch it, you know? Cool cakes. I saw Bee Movie, and it was pretty cute, but not hysterical. Well, some of us are up and awake. I don't know about cleavage, but there was lots of Gerard Butler in it. Yum. As for the remake of Titans, It was ok, just not worth the 3d version of it. And I love the Hatter and Raiders cakes. Double yum. I grew up in the era when HBO only had the rights to about a dozen movies, one of which was the Harry Hamlin Clash of the Titans. I watched it until I knew every line. Took me 3 tries to watch the new one--I kept falling asleep! Yeah, the Medusa's gorgeous and I'm a total snake nut, but even she couldn't save the movie for me. In the end, having waded through that pile of , I can at least be glad they finally convinced me Liam Neeson & Ralph Fiennes (spelling?) are NOT the same person. 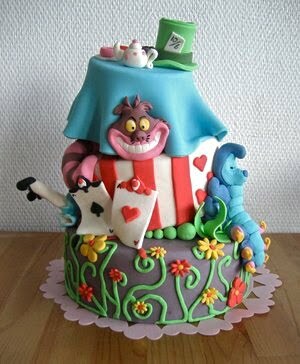 That Mad Hatter cake is awesome. Yeah, the new Clash of the Titans was pretty disappointing. Such promise! Such potential! And they stomped all over it. Thank goodness we didn't pay $10 to see it in theaters! John, you and Jen must "Step in Time" to your Netflix queue and rent "Mary Poppins", just so you can appreciate how brilliant the cake is. The top flowered tier had me perplexed until I realized it is Mary Poppins' magic bag. The penguins are waiters from inside Bert's chalk drawing. You should snuggle down with a bag of popcorn (which now costs much more than "tuppence a bag"), sprinkle on a "Spoonful of Sugar" and enjoy the movie. Chim Chim Cher-ee! I always enjoy Sunday Sweets but I especially loved this week's post! I love the Phantom of the opera cake. That was very cool. We're here on the West Coast! Merry Christmas , er, the day after, and thanks for such a fun month of holiday and , not so holiday, wrecks and sweets! The cakes are great, but as a theatre nerd, I'm very bothered by the Phantom of the Opera cake. The mask is totally wrong! The Phantom wears a mask that only covers the left half of his face- not that weird looking whole-face mask that's on the top of that one. The cake is gorgeous, though! Hey John and Jen, can we pleeeeaase have a Phantom of the Opera Sunday Sweets sometime?? 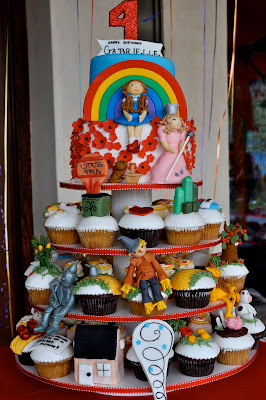 I love the Wizard of Oz cake and the Wicked reference!! Awesome!! Although I wasn't a big fan of the Clash of the Titans remake, there is a brief cameo by Bubo. I LOVE that Wizard of Oz cake... it doesn't hurt that it's my absolute favorite movie of all time, but damn - that cake is awesome! Would it be weird to get that for my 25th birthday? I actually paid extra to see Clash of the Titans in 3D, what a waste of money! And the only appearance of the owl was in a trash heap. The owl was the best thing about the original! I love Mary Poppins and have seen it too many times to count. Loved Linda's comment more than the cake though, because in the mirror you can see the talking parrot umbrella handle is missing his eye on the other side. Other than that its fabulous! No, don't waste time seeing the remake. Instead, go watch Shyaporn's Clash of the Titans (in 60 seconds). It's more entertaining. 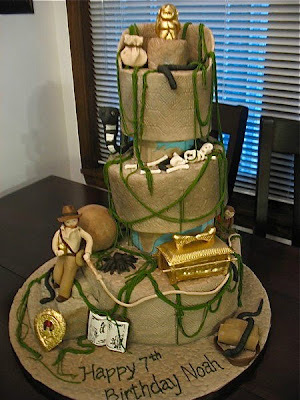 An Indiana Jones cake??!!! Squeel! The new version of Clash of the Titans does have a very short cameo by Bubo, and thus may be worth renting it for $1. 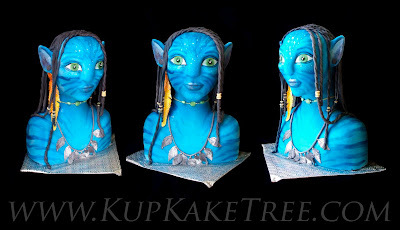 all of these are amazing, but that hatter cake looks like you could actually wear it! for someone who sells antiques, to see that crunchy worn old leather on a pastry is mind-boggling! As for Bubo, I thought I could have him as a pet when I was a kid. I was in love w/that owl! Just seeing this cake makes up for that. Lol Silentmenagerie...I can so relate to your post. I've never had HBO, but I loved the original Clash of the Titans. I applaud your endurance @ being able to make it through the remake. I fell asleep 3 times while watching it with the BF. Sooo glad I didn't waste $$$ on seeing it in the theaters! 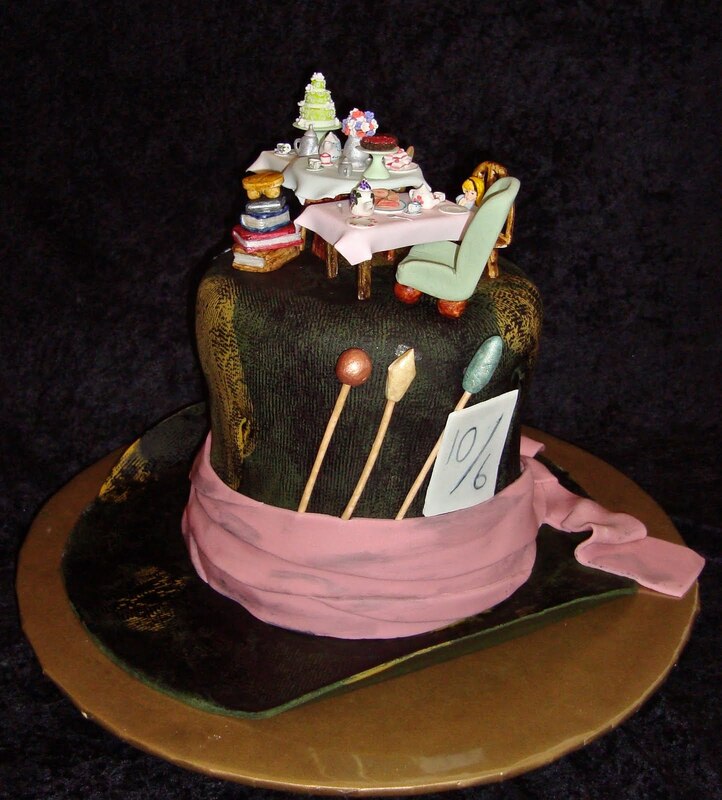 I LOVE the mad hatter cake - now that is some amazing detail work. I *want* that Raiders cake (macabre-ness of chomping Indy's head off aside). Sweet! Love all these. I was baffled for a minute, too, with the bird-head umbrella. Good stuff. There had to be snakes on the Indiana Jones cake. Love it. Bubo! I love him so much and that's just a perfect rendition of the little chirpy guy. The Harryhausen stop=motion animation in the first was just awesome. The re-make was good, but not that memorable. My brother and I went to see Clash of the TItans (his wife refused to join us) as we had grown up loving the original. We had very low expectations going in and left saying "Wow, that wasn't actually as bad as we predicted. It was still pretty bad though." If you can deal with the poor acting, and ignore that the women are a commodity for heroes, and a bit of racial typecasting (more or less what you have to ignore for most American action films), there is a lot of eye-candy and nifty action scenes. On the other hand, the Wizard of Oz cupcakes are charmingly well done. Bubo is my favorite part of Clash of the Titans. He had a little cameo in the remake. It was the only thing I enjoyed about that movie. I love the old clash of the titans... that owl is amazing.. perfect rendition! I'm not really up or awake. Mostly stuffed. But in my semi-dazed state of post-turkey leftovers, I still had enough energy to appreciate the Sunday Sweets. Just so you know, it's never, never wrong to get a Wicked song stuck in your head. In fact, if I ever fall out of a plane or off of a tall building and am wooshing towards death, my final thoughts will be the lyrics to "Defying Gravity." The mechanical owl from Clash of the Titans is my favorite! I really hope that I'll be able to see Wicked while it's here in Tucson. I think Wicked allusion is okay in Wizard of Oz comment. "Did that really just happen? Have I actually understood that this weird quirk I try to suppress or hide is a talent?" "__ sweet music's throne to this kingdom __"
Would someone please be kind enough to fill in the blanks? Bubo had a cameo in the remake. Sigh. I love it and my 3 year old is currently obsessed. Awesome. Never see the remake of Clash of the Titans if you liked the original. Never ever. I'd enjoy these more if I wasn't green with jealousy that a 7 year old got that awesome Indy cake! 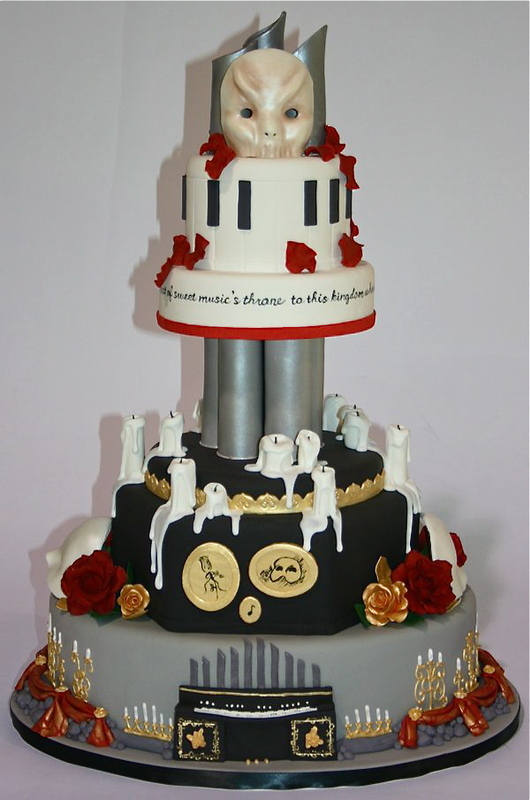 Full quote for the Phantom cake: "I have brought you to the seat of sweet music's throne/To this kingdom where all must pay homage to music." They did make a very good movie of "Phantom of the Opera"--in the 1920s. The 2004 version? I wouldn't recommend it, unless you really, really need a clevage fix. Even then I'd keep the mute button on. 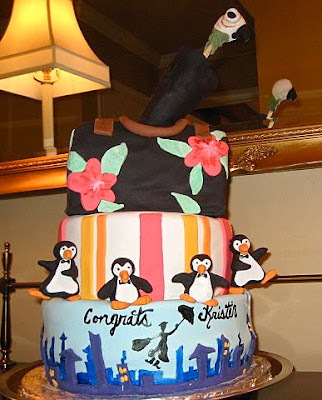 The first cake of Mary Poppins- The top is the bag she carried where she had lots of stuff hidden inside- she kept pulling out everything from it. Thanks for another day of gorgeous! for us fans, you being on holidays and all. It is bad enough going through withdrawal on the Saturdays that you don,t post. Shiver... 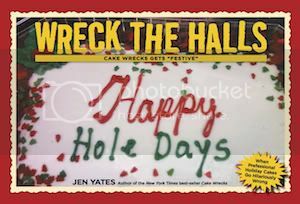 Received a Cake Wreaks book for xmass. Lucky me. It just hit me! All the detail on these cakes - they are like mini versions of Roes Parade floats! Gee--didn't know it was John until he said he put on a smoking jacket...UGH! Merry Christmas! (little late) More fun wrecks in 2011 !!! Aww I love that owl from the original Clash of the Titans. Reminds me I need to watch the copy my hubby bought me for our anniversary. I love all of these but will happily take the owl off their hands lol. Can I just say that I had "Bump Ba Dump Bummp, Dump, ba dump" going through my head before you even wrote it. Jenn NEVER see the remake of Clash of the Titans! It was AWEFUL! Plothole, cardboard cutout characters and really no development whatsoever. 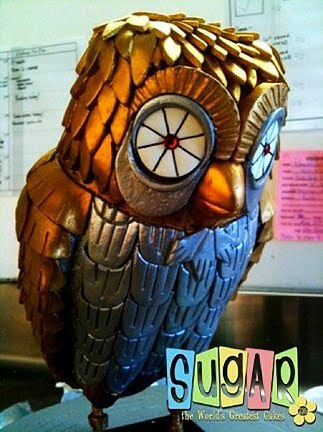 I do love the Bubo cake though! I definitely used to work with the girl that made the Phantom cake! Ashlee does fabulous work! she made a harry potter birthday cake for me along with another girl at the bakery and my mom's sewing basket cake! both were tooo cute and sweet..just like her! I absolutely LOVE Bubo. I think that's my favorite cake I've seen. :D I cannot even begin to tell you how much I love the original Clash of the Titans or how many times I've seen it. Thanks for sharing! You should have had this post last Sunday, before we rented the Clash Of the Titans for my birthday, last Tuesday! We wasted $2 on it! It was OK but not something I ever want to see again. Now, Mary Poppins I could watch every day! I usually come here to feel better about myself and my terrible cake decorating skills, and yet today, I leave here feeling completely inadequate again... haha! Some of these are really cool. In the remake of Clash of the Titans the role of Bubo the owl was replaced by a Bond girl, (Gemma Arterton.) Think about it! She's the owl! 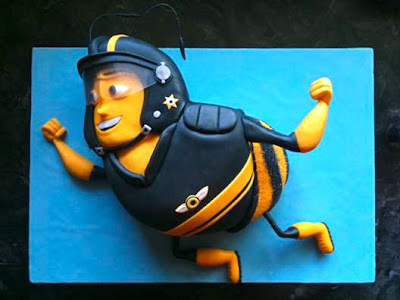 I have to say I had the GLORIOUS pleasure of eating some of that Pollen Jock (Bee Movie) cake - Amanda from Bluebird makes cakes that taste even BETTER then they look (hey I have had the joy of eating 3 different versions plus some cupcakes in the past year!). The woman is an absolute star! (In my head I just made a cake that incorporated all the things I loved. I just laughed out loud and got stared at my the people walking by. hehehe). A GOOD cupcake cake? That's impossible! The world is imploding on itself! Flying hippopotami! Edible school food! Arrrgh! Phantom cake made me squee. Even though the movie is crap compared to the play and book. And I agree! 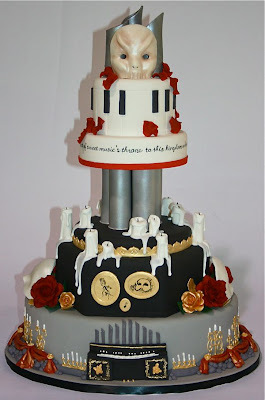 We Phans DEMAND a Phantom themed Sunday Sweets post!